Biggest Loser Home Game? World Series of Dieting? You wanna eat right and look good, but as a grinder living off table-side dining and buffet comps, it’s hard to stick with a plan without proper “skin” in the game. But now you can get paid to lose weight. Really. It works kinda like a tournament — you buy-in for up to $50, which creates a prize pool to be split amongst whoever successfully sheds 4 percent of their body weight in 28 days. Site operators take a small cut for handling the transactions. Huh … an example of the new world of real-money online wagering that’s upon us? I did happen to learn about it through Facebook from a friend who works for Zynga. Dietbet.com seems well-meaning and legit — with rules in play to prevent unhealthy behaviors, along with some general checks to keep cheating at bay. They swear it’s all legal … no problem taking online bets when the competition is a matter of skill, DB says. (Gee, why didn’t poker sites think of that!?) The site, which perhaps curiously is based in Manhattan, aka the DOJ’s Southern District of New York, does seem hesitant, however, to expand their weight loss “games” beyond the current structure of 4% in 28 days. They call it “social dieting” … which kinda makes sense because if you’re committed to losing weight, then why wouldn’t you want friends who are all talk to contribute “dead money” to your prize pool? Supposedly 90 percent of the people who do compete get their money back and then some, with an average weight drop of 9 pounds, which is possibly the real reward for some. And I guess that makes it more like the inverse of a poker tournament — where 90 percent of the entrants don’t get paid to sit around and socialize while getting fatter. Gary Wise has an interesting piece about some action going down on the Global Poker Index. It involves Pokerati non-fave Daniel Negreanu and some bets he’s making on where he’ll end the poker year (i.e. right before the start of th 2013 WSOP). Forget bracelet bets — though we all can wonder if the Pokerstars pro woulda given these numbers any such validity were it still a product of Epic Poker. You gotta figure Negreanu has crunched and recrunched the numbers to believe he’s good — algorithmically, at least. The bet he’s offering is that he will move up 11 spots (he’s currently ranked 31st in the GPI 300) to crack the Top 20 by the end of May. Likewise, he’s giving 3.5:1 saying he’ll finish in the Top 10. All fine and dandy on-the-felt … ooh, excitement, he’s all in with two cards to come, Vince! … and I know for poker pros it’s all about the money. But you can’t help but feel the needling undercurrents if any wagers related to Negreanu’s GPI rank becomes a story — or at least a subplot — moving toward the WSOP. Because, boy, can’t you imagine the chaff to Annie Duke’s hide if Negreanu (of all people) proves capable of profiting off the pride-and-joy player ranking system she created. Every week I open tab after tab and occasionally star a website intent on sharing it with you in some sorta blog capacity … hopefully before my browser crashes. So in an attempt to keep tabs on the poker-industry, here’s a grab-bag of relatively new (to me at least) and noteworthy sites to visit because either they’re really good or I owe someone a favor. 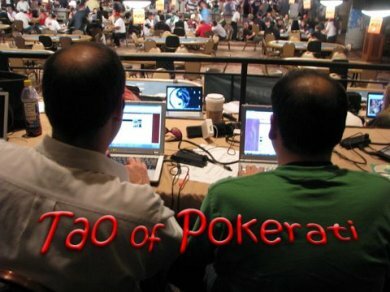 LegalPokerSites.com — These guys hustle to stay on top of poker-related legal matters across America and worldwide … and provide a thorough rundown of the newsbuzz should a certain site’s editor need to catch up with what’s been going on! StackemCoaching.com — Yet another training site … but this one (led by John Kim and Joe Tehan) focusses on live play and offers coaching via audio lessons and live sweats with their stable of pros. Their students (and coaches) make up many of the local grinder thugs, and thus SEC is shaping the way a certain sect of Vegas player handles their chips these days. IGamingNorthAmerica.com — Politicians, regulators, and gaming industry nerds executives descend upon Planet Hollywood over the next few days for a boutique confab with Oscar Goodman introducing Caesars’ chief bean-counter to deliver the keynote. Who woulda ever guessed such a policy-wonk road show like IGNA (with panels on taxation modeling, regulatory timelines, internet security, and liquidity paradigms) would be such a hot ticket in 2012? StupidBetz.com — Possibly in preparation for the inevitable legalization of making semi-obscene jackass-style prop bets online … or maybe just to encourage stupid behavior for money … this site pays out “stupidbuckz” for people to eat bugs, shave heads, and stick tongues in mousetraps. Won’t this be extra fun when you can make these kinda wagers on your mobile phone? Oh, wait, with Leroy’s app you can, anywhere within Nevada state lines, so the army of Aliens camped out at Area 51 should have no problem betting on Ben Lamb and/or Badih Bounahra without revealing themselves to all of humankind. Nevada Gaming just approved some new wagers for the November Nine … some of which are obv, and others that may or may not be a little more silly. Holy moly! Pokernewsdaily.com sold on eBay today for the bargain price of $63,100. I think it’s funny that the top bid increased by more than $13,000 in the last 60 seconds of the auction, but the winning bidder got the site for just $100 more than some other guy who wanted it. I guess that’s the beauty of eBay!! I personally enjoy being a last-minute eBay swooper — like that time I got the Weird Al Yankovic Ultimate Video Collection that someone thought they had locked down for 99 cents when I swooped in all ninja-style to nab it for $1.99. Danielle 1, random bidder 0. With 23 bidders and 88 bids in the fight for PokerNewsDaily, I can only imagine the joy “b***2” felt upon binking the auction. No word on who that buyer really was. But they didn’t even play in the game for Pokerterms.com, a sister site to PND also put up for auction that went to “s***n” for $8,359. This is the first time I’ve heard of an on-line auction for a poker site. It seems as if Protos Marketing, the site’s parent company, was trying to unload these domains (and related assets) pretty fast. I wonder if they are feeling the effects of Black Friday on affiliate-based poker media, or if the previous owners needed cash for WSOP Satellites something bigger and better yet to come. I’ve overheard several people at the Rio talking about friendly wagers they had on the selling prices for these sites. Curious if people here participated in any prop bets … or the actual eBay auctions? It’s time to have a poker player run for President of the United States. Forget Joe the Plumber. How about Tom the Gambler? I actually gave serious consideration to running for President in 2012. However, when I woke up, it didn’t seem like such a great idea. I thought what could a gambler offer that others can’t? I came up with several ideas and am going to share one here. This is not an article about bashing one side or the other. I’m trying to show how gamblers typically get right to the root of the problem by viewing the world differently than others. First, I wanted to identify a problem that 95 percent of Americans would agree was a problem, thus removing all political bias. The Problem: Politicians lie, misrepresent facts and gamble with our money. Do you agree? How do gamblers find the truth? you are no longer gambling because you run out of money. When trying to get the Healthcare bill passed one Senator made a huge deal about the American Medical Association (AMA) supporting the bill, thus trying to make the public feel better since all doctors support it. Did you know that only 17% of all doctors belong to the AMA, because most doctors don’t like the political stands the AMA takes? Did you know that a significant majority of doctors were opposed to the proposed Healthcare bill? It is outrageously disingenuous to act like doctors are supporting the bill. Our elected officials say that if we pass a stimulus package, we will create one million new jobs…oops, sorry, we were wrong. No big deal, we will try something else. They are guessing with our money. I like idiots in a poker game, but I’m tired of idiots in Washington. It’s like all of us voters decided to put the worst poker player in the biggest game. Unfortunately, unlike poker, these idiots can’t get lucky with our money. 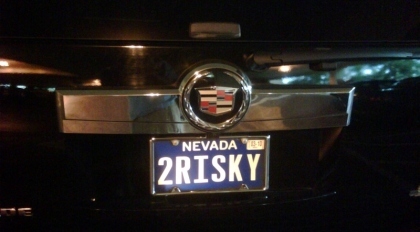 Abbreviated hijinks for good, harmless fun? 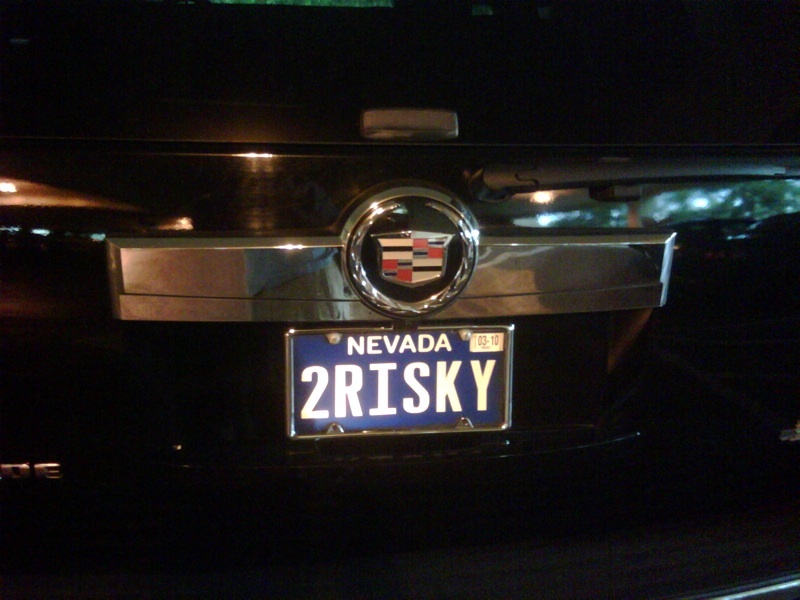 Winner gets to choose the loser’s license plate for a set period of time. Simple, poignant, highly visible … up to 7 characters that if clever enough could stick with your opponent in a way that brings shame and embarrassment for years to come! But because the DMV has final approval, no worries about being tagged with something not-so-funny like HERPES or IH8NGRS. 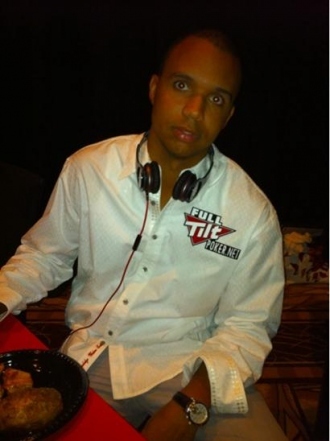 Phil Ivey was at the Golden Nugget enjoying barbecue last night — at Howard Lederer’s World Series of BBQ — when he learned that Tom Dwan was making another serious run for a bracelet, in $10k PLO. 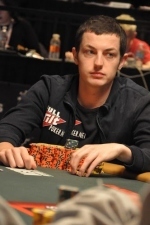 Durrrr in the headlights: Please, Melissa, I’m trying to eat …Who Tom Dwan what? How many chips? I need more sauce. Play ended last night with 33 left and Durrrr the chip leader … by like a lot. (36 got paid.) Phil Hellmuth is 13th in chips, with 330k to Dwan’s 910k. Here’s the event coverage Ivey and just about everyone will be sweating on Saturday: $10k Pot-Limit Omaha. Sigh. If only ESPN knew what Euros (and players in my 1/2 NL/PLO game at the Hard Rock) already do … that Omaha is hold’em, and thus can make for some great TV. Interestingly enough, the last man out for the night (winning $19.8k) was EPT Tournament Director Thomas Kremser … essentially the Matt Savage of Europe. Alexander Kravchenko, another pretty good-TV name, busted him. But hey, this is PLO, so all sorts of card craziness can happen. Let’s reconvene when they get to the final table and see if indeed, poker geeks and uber-high-stakes prop-bettors everywhere will be clamoring about Dwan (and maybe Hellmuth) closing out the WSOP with a multimillion-dollar bang. Every year at the WSOP, there are those “working it” who win, and those who lose … and plenty of us who have done both before and now do the bare minimum just to maintain and somehow stay in the game. Whether it’s being media, flooring, dealing, executiving, whatever … it’s not too different from what the full-time players have going on in their own poker pursuits. One of the clear winners this year has been Tim Fiorvanti, aka @Tim00, aka “Timtern”. This WSOP youngster returned for his second Series to be a pathetically paid PokerRoad intern … and shortly into it got an additional gig as a pathetically paid Bluff Magazine writer. Nice! Furthermore, while he hasn’t exactly torn the game up, he has become a regular and respected player in Pokerati’s 1/2 nl/plo @HardRockPoker. Thus, I was delighted to see him take-it-down further, throwing projectiles from press row to earn proper respect from Pauly, Benjo, and even the real professor, Shamus, who showed even gray-haired academics aren’t afraid to put it all on the line against any young or not-so-young poker challengers. Sometime after midnight, we let it all hang out with the gang in the press box who engage in a silly, yet innocuous throwing-things prop bet that began with Pauly and a single piece of wadded up paper. Before everyone knew it, Benjo, Shamus, and ten other bored members of the press (both foreign and domestic) were joining the fray. Degen prop betting often keeps the free press sane during those late night insane hours, as Tim the Intern took down the inaugural Small Ball Cup. “This was a huge shot in the arm for the gambling community,” said Mike Matusow to his table in the $10k Stud-8 World Championship, referring to a couple-million+ of anti-durrrr-bracelet sidebets. Frankly I was kinda surprised to see Lederer so nervous. Would seem that he was the one guy who couldn’t lose … you know, having the newest pro added to his team taking down an early WSOP donkament, for the first of what will likely be multiple bracelets. Congrats to Tom Dwan! We were all rooting for you… To come second! Wow I escaped. What a sweat that was. Durr just doubled up and the rail cheered while most of the people in the stud 8 moaned and cried. The atmosphere in the room is electric. So many of us have bets against Durrr winning. 3 left and we are sweating hard! I’m enjoying sweating the Durrr match mainly because I have no money on it:) Big swing for a bunch of my friends and relatives though. Meanwhile, Huck Seed is apparently owed a refund. Though I suspect he might just let Dwan hold on to the $325k, figuring that a 2010 bracelet may be inevitable. Concerning the prop bets, one person has already paid $325,000 to Dwan. To find out who that was, check out Pokerlistings. Surreal. A congregation of Big Game players are currently having a sit-down, most likely discussing offering Dwan to buy out of their bets. In just a few short hours, the 41st World Series of Poker will get underway at 12 noon at the Rio in Las Vegas with the first bracelet event, the $500 Casino Employees event. This will be followed at 5pm with the $50,000 Players’ Championship, consisting of HORSE, no-limit holdem, pot-limit Omaha, and 2-7 triple draw lowball with no-limit holdem being played at the final table. Last year’s Casino Employee’s winner was Andrew Cohen, a bartender at the Palms, who won $83,833 in a field of 866 players. 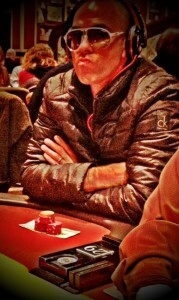 Hopefully Team Pokerati member John Harris can improve on his 25th place finish last year. This is the first year for the $50,000 Players’ Championship, a five-day event that is replacing the $50,000 HORSE event that was held the previous four years. David Bach won what appears to be the final $50,000 HORSE event last year, besting a field of 95 to earn $1,276,806. The Chip Reese trophy that was given to the HORSE winner will now go to the Players’ Championship winner. For those looking for updates, the official WSOP site will have live updates powered by PokerNews. This year, the WSOP.com site will also be making various tournament information available to everyone, including entry lists, end of day chip counts, tournament reports from WSOP media director Nolan Dalla, as well as the media guide. CardPlayer, Bluff Magazine, PokerListings, PokerRoad, ESPN.com’s poker section and other poker media outlets (like Pauly) will provide updates, reports, gossip, video segments and other stuff for the poker enthusiast. Does the Year of the Woman continue? With the wins of Annie Duke at the NBC Heads-Up, Vanessa Selbst at NAPT Mohegan Sun and Liv Boeree at EPT San Remo, the poker media is anticipating a breakout WSOP for women. The last year more than one woman won an open bracelet event was in 2004 (Annie Duke, Kathy Liebert and Cyndy Violette). How will Annette Obrestad perform? This is Annette’s first year she can actually play at the WSOP in Las Vegas instead of being a spectator limited to the hallway, a moment that has been eagerly anticipated by the poker community since she won the 2007 WSOP Europe Main Event at 18. She’ll be the most followed, scrutinized, criticized, fawned over, etc. newcomer of this year’s group of WSOP newbies. How will the UIGEA affect the WSOP? With the June 1 deadline rapidly approaching, online sites and players are wondering what will happen in the next few weeks. Does the US Department of Justice swoop down on the Rio and arrest Team Full Tilt? Will players not be able to get their funds in time for the Main Event? Will it be business as usual, with no noticeable drop in attendance at the Rio? Betting on Bracelets Bracelet bets for big money is not reserved to Phil Ivey and his fellow pros. Justin Bonomo was laying 10 to 1 (1k minimum to Justin’s 10k) that at least one person from a list of people living at Panorama Towers will win a bracelet at the WSOP. Bonomo offered the same bet last year, laying 7 to 1, and Greg Mueller’s two bracelets had Bonomo winning his bet. The big Phil Ivey bet this year is with Howard Lederer: Ivey has the 2010-12 WSOPs to win two bracelets, WSOPE bracelets count only towards making the bet a push, for $5 million. Talk of other bets Ivey will surely hit the rumor mill over the coming weeks. More updates to come during the next few weeks, and good luck to all the players.